Listen to the Cancer.Net Podcast: Tips on Caregiving, adapted from this content. A caregiver is a member of an important team of family members, friends, volunteers, and the health care team. Each member of the team offers different skills and strengths to provide effective care. If you are the main caregiver, help each team member express concerns, opinions, and emotions. Also, make sure that the person with cancer has a central role in all discussions and decisions, if possible. CancerCare provides a special website for caregivers, My Cancer Circle. This website can help caregivers organize family and friends who want to help. Find other online communities for support. Start by making a list of all your caregiving tasks. Try ordering them by importance. Then, use the list to decide how to divide the tasks between friends, family, professionals, and other volunteers. Learn more about sharing responsibilities. Take charge and plan as much as possible to prevent last-minute emergencies. This can also help provide a sense of control and order. Create schedules that list which relative, friend, or other volunteer is available when and for what tasks. Make sure that all of the caregivers involved have some time to be away without feeling guilty or concerned. Long-distance caregiving takes even more planning. Find out more about how to be an effective long-distance caregiver. Identify problems, find out what is needed, and follow through. Do not be afraid to seek advice and help from others. Look for creative solutions that work for you and the person you care for. Having a positive attitude can help set the tone for all that you do. You may not have control of what happens to you, but you can change how you react. To help cope, talk with other members of the caregiving team. You may also wish to talk with friends, religious or spiritual advisors, counselors, and health care professionals. Recognize your own strengths and weaknesses as a caregiver. This allows you to set boundaries and know when to ask for help. Setting limits can help you and the person you care for. The person you care for can exercise some independence, while you get a break. It is important to recognize when you need a break so you don’t feel burned out. Learn more about how caregivers can take care of themselves. These services include professional home care, home-delivered meals, and help with everyday activities. Some community agencies have volunteers who can help with transportation or advocate for health insurance or other benefits. A local hospital or community social worker is a great source for referrals to programs in your community. Learn more about different caregiving options. It’s important to help the person you care for maintain a sense of control. A cancer diagnosis may make him or her feel little control over life. Start by asking if you can help with a specific task or decision instead of doing it on your own. One of the caregiver's most important jobs is to communicate openly with the person who has cancer. Choose a time that is convenient for both of you to talk. Provide assurance that he or she will be a central part of all discussions and decisions. Be open to the person’s feelings and opinions. And allow enough time to fully explain your feelings. A person who just received chemotherapy may not be able to taste a meal you worked hard to prepare. Or a person on pain medication may not notice all of the small things you do. Be aware that caregiving tasks may change as the person’s health changes. A person with cancer may no longer be able to actively participate in activities he or she enjoys. So look for other ways to encourage involvement. Help the person stay connected to the world beyond cancer and maintain a sense of normalcy. As a caregiver, you may find that your responsibilities range beyond what you expected. Such responsibilities can include providing medical and physical care as well as handling some financial issues. Learn more about cancer, including the patient’s type of cancer. Many patient advocacy groups also can provide information related to specific cancers. Ask the doctor about other trusted resources. Keep a record of medical appointments, test results, medications and dosages, symptoms and side effects, questions, and names and numbers for resources. Find out more about managing a patient’s care. Take an active role in the patient's medical care. If possible, go with him or her to all medical appointments. It is helpful to write down questions for the doctor beforehand as well as the answers. Also, give the doctor any new information that helps him or her make informed decisions. Learn more about talking with the doctor. Some patients may need you to provide physical care such as bathing, dressing, feeding, using the toilet, and grooming. For help, talk with the health care team, watch health care videos, or read manuals or books that explain how to do these tasks. You may also want to hire professional help for these tasks, if possible. Caring for someone with cancer can be expensive for the patient as well as the caregiver. Talk with your loved one about who will perform medical services and how services will be paid. Learn more about addressing financial issues. If the person you are caring for cannot speak for themselves, certain legal documents can allow a designated person to communicate his or her treatment decisions and wishes. Learn more about helping your loved one plan for his or her health care ahead of time. 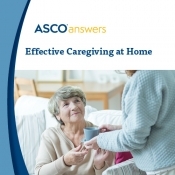 Download Effective Caregiving at Home (PDF), a 1-page (front and back) introduction to caregiving at home, including ways to manage the responsibilities of caregiving, resources specific to caregiving needs, and tips for taking care of oneself. A caregiving action plan on the back helps caregivers divide tasks among friends, family, professionals, and others to help make caregiving a team effort. Order printed copies from the ASCO University Bookstore.